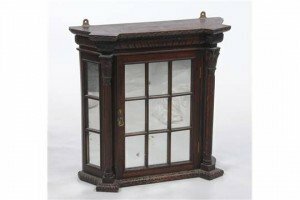 A hardwood hanging display cabinet with a leaf carved frieze, outset fluted columns enclosing a mirrored door. 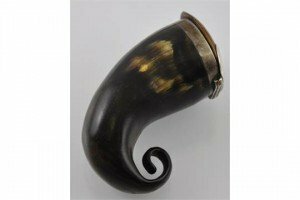 An early 19th Century Scottish white metal mounted horn snuff mull, the cover with initial engraved cartouche. 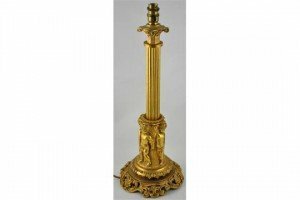 An early 20th Century ormolu table lamp with fluted column over a band of cast putti on pierced shell and scroll foot. 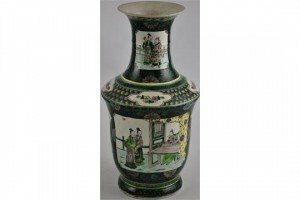 A late 19th century Chinese Famille Noire porcelain vase of shaped cylindrical form with flared neck decorated with panels of figures, bears black six character Kangxi style mark to base. 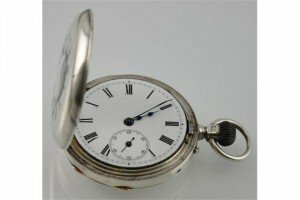 A Victorian silver half hunter pocket watch with subsidiary seconds, case with blue enamel Roman Numerals, Army & Navy Corporation, London 1880. 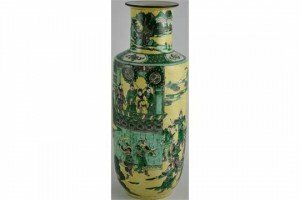 A late 19th Century Chinese porcelain vase of cylindrical form with flared neck decorated with a continuous scene of a nobleman and warriors, on a lemon glazed body. 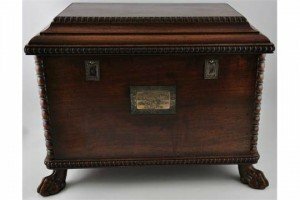 A George IV mahogany deed box of beaded sarcophagus form on carved lion’s paw feet, bears St Andrews Assurance Paisley Society plaque, dated 1828. 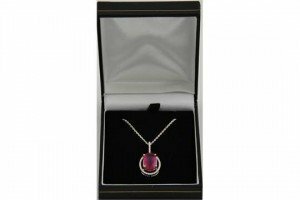 An oval treated ruby pendant, the 6.6 carat faceted stone claw set in an 18 carat gold 0.5 carat diamond surround on a fine link chain. 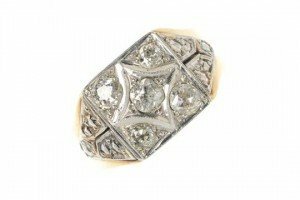 An Art Deco style diamond cluster ring in a white metal band with pierced shoulder, the diamond approx. 1ct. 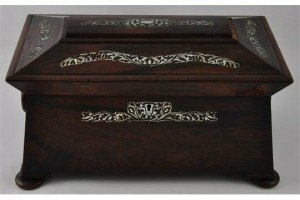 A Victorian mother of pearl inlaid rosewood sarcophagus tea caddy with lidded twin canister interior on flat bun feet. 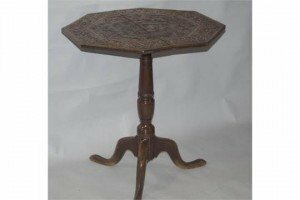 An oak and elm occasional table, made up, the octagonal top carved with leaves and fruits, raised on a baluster turned column above three cabriole legs. 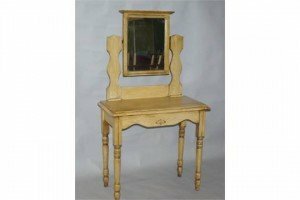 An Art nouveau style pine dressing table, on tapering supports, with later added banding decoration, with central Art Nouveau style fan. A diamond and gem-set cross pendant. 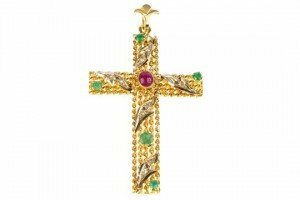 The oval-shape ruby cabochon, to the rope-twist panel cross, with rose-cut diamond foliate, emerald and green-chalcedony detail. 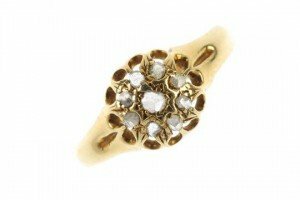 An early 20th century 18ct gold diamond cluster ring. The rose-cut diamond cluster, to the tapered shoulders. Hallmarks for Birmingham, 1915. Weight 2.6gms. A diamond cluster ring. The old-cut diamond square-shape panel, to the textured shoulders and plain band. 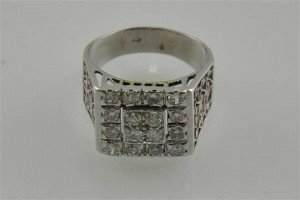 Estimated total diamond weight 1.30cts. Weight 13.3gms. 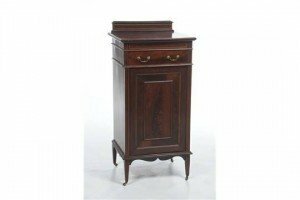 An Edwardian inlaid mahogany music cabinet, the rectangular moulded top above a frieze drawer, stamped H Holden, Waterloo, above a panelled cupboard door enclosing four sliding trays raised upon vase shape legs and castors. 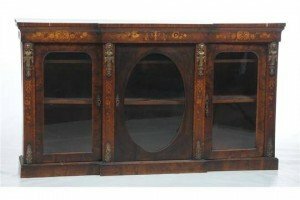 An 19th century bur walnut and marquetry breakfront side cabinet with a frieze inlaid with flowers and leaves above glazed cabinet doors enclosing shelves with outset columns applied with gilt metal figural mounts raised upon a breakfront plinth base. 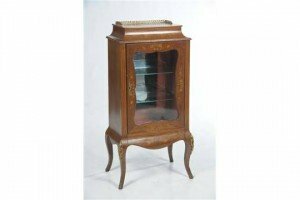 A Continental marquetry cabinet with a gilt metal gallery above a concave frieze inlaid with ribbon tied flowers above a kidney shaped glazed door, the frieze inlaid with marquetry enclosing two shelves with a mirrored back, later light fitting above a shaped apron raised upon curvilinear legs with gilt metal sabots and shutes. 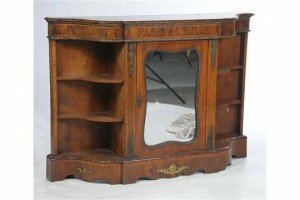 A Victorian bur walnut and inlaid breakfront credenza, the shaped frieze with gilt metal floral leaf and ribbon tied mounts above a cabinet door with a kidney shaped mirror, enclosing a velvet lined shelf flanked by curvilinear shelves raised upon a plinth base with gilt metal mounts. 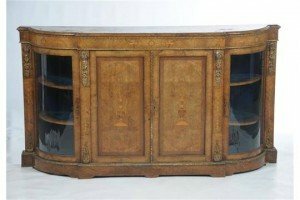 A Fine burr walnut and marquetry inlaid breakfront credenza, shaped top above a frieze inlaid with marquetry flowers, gilt metal leaf and roundel mounts above a pair of cabinet doors finely inlaid with classical urns and flowers enclosing two blue beige lined shelves flanked on either side by a bow front glazed cabinet door, outset columns with gilt metal leafy mounts raised upon a breakfront plinth base.